Since our early preview launch back in April we’ve seen a huge amount of interest in Microsoft Flow. We initially opened up the preview to only email addresses provided by your work or school, like those used with Office 365 Business or Office 365 Enterprise. Today, we are announcing that the preview is officially available, free to use, for all users, no matter what email you may have. 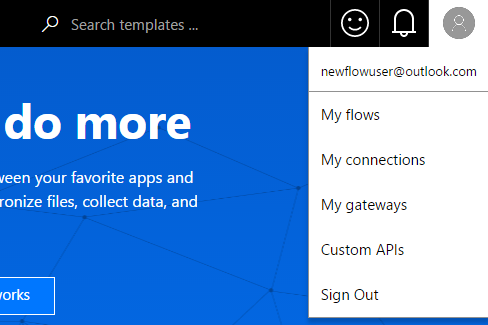 To get started with Microsoft Flow you just need to sign up with an email address. The best way to sign up for Microsoft Flow is to use the email address that was provided by your work or school, because there are features that will only be available for organizations. For example, the ability to connect to on-premises data sources requires an organization. Likewise, in the future, you will be able to share content to your colleagues within your organization. Signing up for Microsoft Flow with your work or school email address will enable these scenarios. You will need a Microsoft Account. If you don’t already have a Microsoft Account (such as you use with OneDrive or Outlook.com), creating an account takes just a few seconds: go here to create one. When you create a Microsoft Account you can choose to use an existing email address, or create a new one. Next, go to Sign in at the top of the page and enter the email address you used to create the Microsoft Account. You will be redirected to the Microsoft Account page and can then enter your Microsoft Account password and select Sign in. Finally, Accept the preview terms and conditions. You can now get started creating a flow from a template or from scratch. In order to sign in to the Microsoft Flow mobile app, be sure to download the latest version (version 1.4.0 or later is required). Some of our most popular flow templates have been used thousands of times already – if you have a Microsoft Account, now is your opportunity to check out Microsoft Flow and work less to do more!